In 1977, Marcia Resnick, then 26, began photographing the downtown Manhattan cultural scene. Downtown was “where it was at” for a convergence of rock and roll, jazz, film, literature and art that in retrospect stands as as the counterculture’s last hurrah. And what a hurrah it was. Resnick reflects back on this era by musing “The people from the extraordinary New York milieu amongst whom I was living and working had no way of knowing that the years between 1977 and 1982 were enchanted, endangered, and unrepeatable.” It’s these years that the book covers. Text by writer Victor Bockris provides much thoughtful insight. There’s also antidotes and accounts from Resnick herself that accompany the images throughout. This fine, 270 page book focuses mainly on maverick men, i.e., bad boys. Resnick defines a bad boy as those that, as she puts it “Have a special magic, who has charisma, and who braves living on the edge.” Some of the figures that comprise this aesthetic here are the defining beat poets William S. Burroughs, Allen Ginsberg and Gregory Corso, rock and rollers Mick Jagger, Iggy Pop, Johnny Thunders, David Byrne, Joey Ramone and Brian Eno. 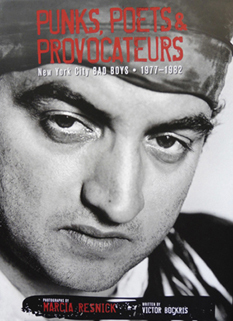 Under the the provocateurs and raconteurs categories there’s such people as Norman Mailer, Steve Rubell, John Waters, Lester Bangs, Gary Indiana, Andy Warhol, Abbie Hoffman, and the unforgettable man on the cover, John Belushi. There are many more people in all of these spheres, but here’s a taste.